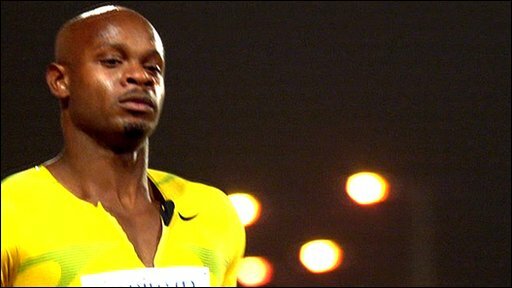 Sprinters Asafa Powell and Tyson Gay will go head-to-head twice in the UK this summer ahead of London 2012. The pair will meet at the Birmingham Grand Prix on 10 July and at Crystal Palace on 5 and 6 August. 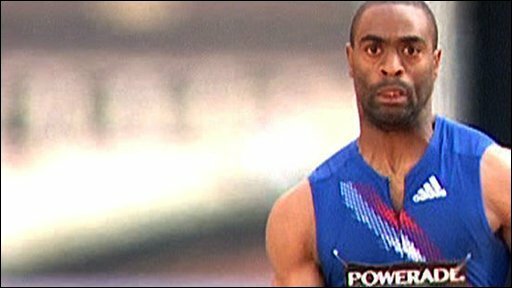 US athlete Gay set the fastest 100m time in the world at the 2010 London Grand Prix and Jamaican Powell is a former world record holder. Powell said: "Running in the UK always feels like being at home - it would be good to set another record there." Both events will be included on the Diamond League circuit and the London race will take place exactly a year before the 2012 Olympic 100m final. Gay narrowly beat Powell last year at the British Grand Prix in Gateshead and the American went on to clock a time of 9.78 seconds in London, with Powell missing the planned rematch through injury. But 28-year-old Powell, who equalled his own world record of 9.77 secs in Gateshead five years ago - which still stands as the fastest time recorded on UK soil - is upbeat ahead of the contests. "As always I'm looking forward to racing in the UK this summer. I hope to be fit and healthy for the fans, especially as there will only be a year to go until the Olympics," Powell added. "Tyson and I enjoyed a great race against each other in Gateshead and I'm sure it will be the same at the Aviva Birmingham Grand Prix. "I have only run in Birmingham once before, but if it is like London I know there will be a lot of Jamaican fans coming to support us. It's because of this support that running in the UK always feels like being at home." The Birmingham race at the Alexander Stadium will be the first Diamond League meeting to be held in the city. Powell and Gay will be eager to record the first sub-10-second time at the the venue, which both the United States and Jamaica teams will use as a practice facility during London 2012. And the pair will also want to lay down a marker ahead of the 2011 World Championships, which take place in Daegu, South Korea from 27 August until 4 September. "This year is most definitely about preparing for the World Championships and these two meets will be an important part in that process," Powell commented. "Going head-to-head with Tyson last year in Gateshead reminded us of the great rivalry we have had over the years and I'm not scared to put myself up against him; we drive each other on. "I still hold the fastest time to be run in the UK but you never try to be too concerned about the times, as it is all about winning races." Powell's world record has since been broken three times by fellow Jamaican sprinter Usain Bolt, who indicated last year that he will not be competing in the UK until London 2012. Olympic and World 100m champion Bolt's world record stands at 9.58 seconds. But Bolt's only two career defeats have been at the hands of Powell and Gay respectively, with 28-year-old Gay beating Bolt in his last outing when the pair raced in Stockholm on 6 August 2010.